My grandma made the best cornbread dressing and it has been our family tradition to have it with Giblet gravy since long before I was old enough to walk. Preheat oven to 450°F. Put the bacon drippings/butter in a 9x13-inch baking dish and put it in the oven while it is preheating. It will melt while you're mixing up the batter. Preheat oven to 375°F. Crumble the cornbread and white bread into a very large baking dish or pan (This is the pan you will cook your dressing in, and you need room to stir it while it's cooking). 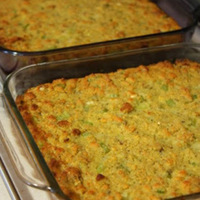 Combine the vegetables with the bread crumbs and mix well. Melt the butter and add it and the beaten eggs, chicken broth and stir. (You may need a little more chicken broth – its better if it's too moist than too dry; the uncooked dressing should be a little on the slushy side.) Add poultry seasoning, rubbed sage, black pepper, and mix thoroughly. Really great dressing try it. I made your dressing for this thanksgiving and it was awesome. Thanks for sharing your family recipe. instructions are incomplete, it says you need to stir while cooking but never mentions when or what in the directions. 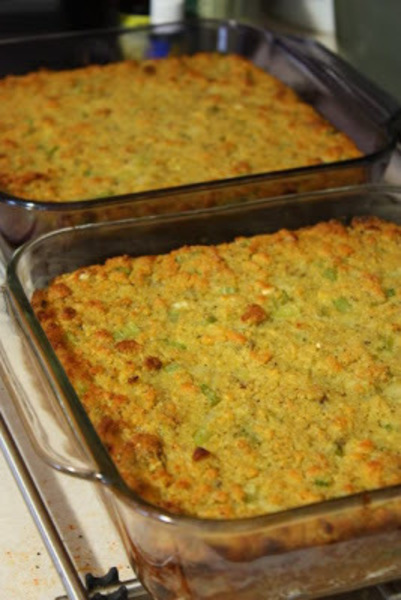 How long do you cook the cornbread and how long do you cook the dressing? i have always cooked my vegetable before combining them. I will not be making this. So far Paula Deen's is the best for me as it's the closest to my mom's as i have ever tasted. how long does each item bake for? You don’t put any flour in your cornbread? Looks delicious, I can't wait to make this for the team!!! How long do you cook the cornbread at 450? How long do you cook the dressing at 375?